Ticks, no one really likes them and no one seems to know their purpose, but they can cause problems. There are many diseases carried by and transmitted through the tick. Today, we will discuss Lyme disease. This is a zoonotic disease, meaning it can be transmitted to humans by the tick. Lyme disease is caused by a spirochete organism called Borrelia burgdorferi. It is transmitted primarily by the Ixodes species of tick (the black-legged tick). This particular tick feeds in all three stages of its life cycle-- larva, nymph, and adult. For those of you interested, the tick is an arachnid, it has eight legs as an adult and six legs as a larva. The immature larva or nymph tick feeds on rodents and this is where it acquires the disease. As the tick molts into the next developmental stage, the organism stays in the tick. It is then transmitted to another host in the next stage of the life cycle of the tick. It is not however passed on to the eggs from an infected female. Lyme disease is seen in dogs commonly, but rarely in cats. Dogs and human are infected with the disease when a tick carrying the organism feeds on them as a host. It takes 24-48 hours for the tick to transmit the disease. Many dogs will have a subclinical infection and not show signs. Some dogs will develop infections and the signs may include fever, shifting leg lameness, lethargy, depression, anorexia, enlarged lymph nodes and swollen joints. These signs usually resolve with antibiotic treatment. 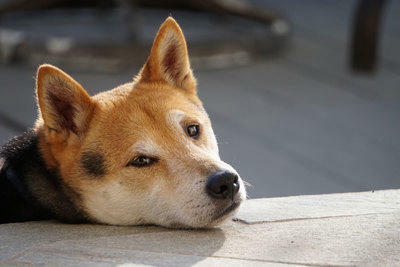 In the dog, chronic disease can lead to joint changes and arthritis or kidney disease. The signs in people are a little different and can be more severe. People typically have a lesion called erythema migrans, this is a bull's eye lesion in the area where the tick bite occurred. People will get a fever, muscle soreness, headaches, joint pain. If not diagnosed quickly enough in people, Lyme disease can lead to arthritis, neurological disease, and heart disease. Disease in people is more common in areas where there is more disease in the dog, so some consider the dog a sentinel for human disease. So how can you help to prevent this disease in your pet or you? The disease is more prevalent in the northeast, upper Midwest and west coast regions of the United States. However, we do have a lot of people and pets who travel to Florida from those regions. There is a vaccine for Lyme disease, most veterinarians would consider it a lifestyle vaccine, meaning that it would be recommended if your animal is exposed to a lot of ticks and lives or travels to these regions. Tick control is very important. A product to prevent ticks from attaching and feeding should be used-- there are topicals, collars, and soon an oral medication for this. Also, check yourself and your pet for ticks. Ticks should be removed as soon as they are found, remember the longer they feed the more likely they will transmit disease. Do not use your fingers to remove the tick, exposure to the contents of the tick's body can lead to disease spread. Use forceps or a commercial device for removing ticks. Be sure to wash your hands after this procedure. If you are walking in an area where there are ticks, wear light-colored clothing that covers all parts of the body (so you can see the tick crawling on the clothing and remove it before it attaches to you), wear a repellant and be sure to do a tick check on yourself when you return home. There is another disease similar to Lyme seen in people called Southern Tick-Associated Rash Illness (Masters disease). It is believed to be transmitted by the Lonestar tick (the most common human-biting tick in Florida). In people, you will see a rash similar to the Lyme rash, and the signs are almost identical (tiredness, fever, muscle and joint pain). This disease seems to be less severe than Lyme and currently, the exact causative organism has not been determined. So, be sure to protect yourself and your pet from ticks. Check your pet and yourself for ticks and remove them as soon as they are discovered. Discuss a tick control regimen with your veterinarian, there are many products available. 3631 State Rd. 60 E.